Theodore Roosevelt is not remembered by many today, but a study of him would open eyes. His personality lent itself to caricature and many were merciless. Many faults and mistakes are uncovered, but he had a driving force that overcame a lot of obstacles, many of which are prominent today. As with her book on Abraham Lincoln, Doris sets the context. We are individuals moulded by our context and it makes more sense when trying to understand an historical person that their historical context be part of the story. The Bully Pulpit pairs Theodore Roosevelt with William Howard Taft, two different personalities, but with a common political philosophy. Of course their families were important to their success, but Doris identifies another important part of the situation--journalists. Journalists were a key part of Roosevelt's success. There is quite a contrast with today's politics. Roosevelt courted journalists not only to promote himself, but to get their opinions on society and the economy. Roosevelt encouraged journalists to do exposures of corporate abuses and felt often that was the only way for the public to overcome corrupt politicians. Sam McClure who is covered in great depth as publisher encouraged his reporters to expose abuses in America. How Roosevelt got to be president was unconventional. The party bosses found him annoying because he was not sympathetic to big business abuses and kept putting him places where they felt he could do no harm. He was police commissioner in New York and found all sorts of abuses (often by masquerading his identity and taking a reporter to check on patrolling police or slum landlords). He became a young Governor of New York and antagonized party powers so that they arranged for him to be nominated as Vice President for the 1900 election. In those days it was not fashionable for presidents to campaign the way they do today so Theodore did most of that and was instrumental in getting President McKinley re-elected. As vice president he was not consulted very much nor given very much to do, but an assassin's bullet ushered Roosevelt to be the youngest President. Once in power, Roosevelt energetically set about correcting what he saw as faults. He felt big corporations were very abusive in their treatment of employees and customers. At the same time he rejected socialists thinking that they would throw out the baby with the bath water. Instead he felt regulations were the answer. Big corporations resisted his efforts and were able to buy a lot of support from Congress, but Roosevelt tempered this by encouraging journalists to expose abuses. Roosevelt was relatively liberal in his views, but recognized you could only push so far. He invited Booker T Washington, prominent black leader to dine at the White House and was criticized for it, none the less he managed to appoint some blacks to positions. He was an advocate for giving women the vote. It was amazing what he could accomplish despite the opposition of big money, but he realized compromise was a step on the way to making improvements. As a hunter and outdoors man he set up conservation areas realizing big business would take over any land they felt they could make a profit on. He admired and befriended William Howard Taft. Their wives were opposite in some regards. Roosevelt's wife avoided the limelight and hated campaigns. Taft's wife discouraged her husband from pursuing what he really wanted which was a judicial appointment and pushed him to politics. Roosevelt also pushed Taft towards politics, but twice offered him Supreme Court positions. Taft was Governor of the Philippines and felt duty bound to help set them towards democracy. Taft and Roosevelt had a falling out due mainly to Roosevelt if I read Doris correctly. Teddy, still a young man desired to have power and felt he had demonstrated he could use it to good effect. Taft was not as charismatic, but a very intelligent ethical man. In the end the squabble between the former friends allowed Woodrow Wilson to win the 1912 election. In a short review there are many interesting and important details that are skimmed over. 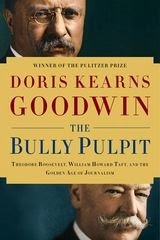 Doris Kearns Goodwin is excellent at describing the political maneuvers of the time. She recognized the role of journalists and has given whole chapters to describe their efforts which were inter-twined with the politics. This has been only my second reading of a Doris Kearns Goodwin, but her writing is something to explore and look forward to.